OK OK OK.....the lighting was really bad when I took these pictures!!! But I haven't done any work in a while so I felt I should post these!!!!! I realy really like them....hahhahah... 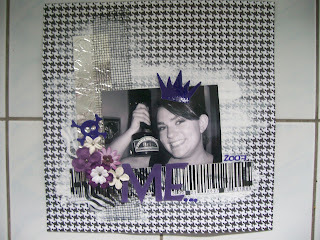 I LOVE one page scrapbooking!!!!!! My selfish layout...Everyone needs one...The bottle I am holding is a bottle of Britt Coffee Liquor..MY NAME SAME... but no...I was not named after it...but I have the bag...and the cup!!! 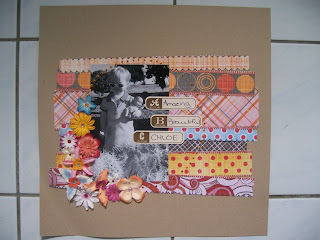 And just another Chloe Layout...*LOVE* craft paper!!!!!!! And the 'is for' stickers from Prima! Also thanks to Marie who dropped off my blog candy to me last night at work!!!! Super nice of her. Can't wait to go see her studio!! !